Please respect the operating hours and rules posted at the Collection Facility. Collection Facilities are establishments registered with UOMA NB to receive the designated products from small generators free of charge. These collection facilities are mechanical workshops, car dealerships but also many commissions. UOMA NB has developed a netword of over 189 collection facillities throughout New Brunswick. We congratulate the repair shops and the commissions that agreed to be a collection facility and offer the service free of charge to the population. It has never been easier to recover these products. 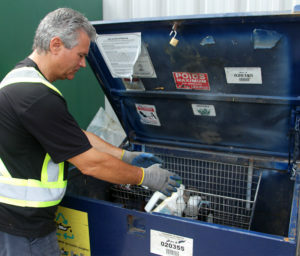 * For larger generators of used oil materials, there are registered collectors that will come to your site, farm, place of business and take the material to a registered processor. Oils: Means petroleum or synthetic derived crankcase oïl, engine oïl and gear oïl, and hydraulic fluid, transmission fluid and heat transfer fluid, and fluid used for lubricating purposes in machinery or equipment. Filters: Means a spin-on style or element style fluid filter that is used in hydraulic, transmission or internal combustion engine applications and an oil filter, a diesel fuel filter, a storage tank fuel filter and a household furnace oil filter other than a gasoline filter. Oil containers: Means a container with a capacity of 50 litres or less manufactured for the purpose of holding an oil product. 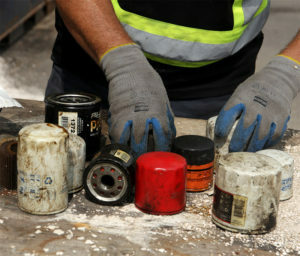 Aerosol containers: Aerosol containers manufactured for the purpose of holding an oil product as well as aerosol containers used to contain products used as brake cleaner. The aerosol lubricant and the aerosol brake cleaner. 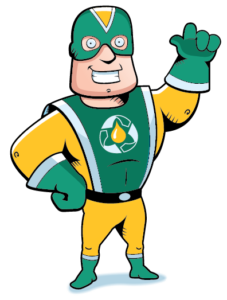 Glycol (antifreeze): Means ethylene or propylene glycol used or intended for use as a vehicle or commercial engine coolant, but does not include the following plumbing antifreeze, windshield washer antifreeze, lock de-icer and gasoline and diesel fuel. antifreeze. Glycol (antifreeze) containers: Means a container with a capacity of 50 litres or less manufactured for the purpose of holding glycol (antifreeze). If your company or commission is interested in registering as collection facility for the recovery of products covered by the UOMA NB program, we invite you to complete the ONLINE REGISTRATION FORM. The benefits are numerous. Being recognized as an environmentally conscious enterprise, you will be rewarded with the various incentives put in place. You will receive a registration bonus of $ 100 plus taxes on the 3rd month following your registration and you will benefit from the promotion on filters (see next section). You will be added on the UOMA NB website giving you additional advertising and increasing traffic to your business. We invite you to consult the list of benefits in becoming a collection facility by using the following link : Benefits. We wish to thank all the garages, mechanical shops and commissions who have already registered as Collection Facility for the UOMA NB products for your genuine concern for the environment and your commercial vision. As an appreciation for registering with UOMA NB as a collection facility, and to encourage you to increase your filter collections, UOMA NB has implemented a PROMOTION on filters. In fact, UOMA NB will pay collection facilities subsidies (RIs) based on the amount of filters (by weight) collected by UOMA NB’s registered collectors. You can submit your claim to UOMA NB at your convenience : Quarterly (3 months), bi-annually (6 months) or annually. You will find the details of this promotion and the return incentive claim form by using the following links : Details of the promotion and Online Claim Form.